Will you bake some chocolate chip cookies for me please! my friend’s eight year old daughter pleaded. Since its holiday time and no christmas is complete without chocolate chip cookies I decided to bake some for all of us. She was super excited and helped me through out the process. 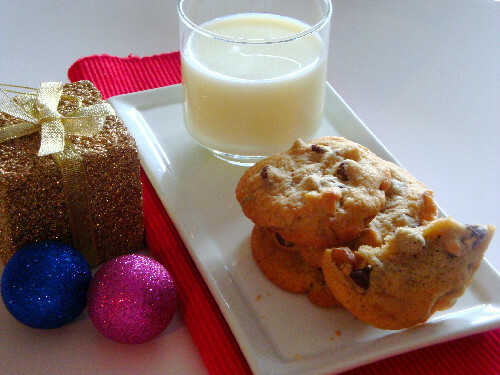 The result, are these warm delicious cookies that tasted yummy when dunked in a glass of milk. Would you love to try some? Then you’ve got to try these. Here’s how …..
Use softened butter. Leave the butter on the counter top overnight if you are baking the next morning. The idea is to bring the butter to room temparature before mixing it with other ingredients. When measuring flour, spoon it lightly into a measuring cup and level it off with a spatula or a knife. Baking soda should be mixed with dry ingredients before any liquids are added. Line the cookie sheet with parchment paper to help cookies come out easily and it makes cleanup easy too. I baked one sheet at a time to provide the best circulation in the oven. cool the cookie sheets between baking each batch. In another large bowl, combine butter, light brown sugar, granulated white sugar and vanilla extract. Beat at medium speed until the mixture is light and fluffy. Stir in the chocolate chips and chopped nuts and mix until just combined. Drop the dough using a scoop or by spoonfuls onto the baking sheet 2 inches apart. Bake for about 10-12 minutes until the edges are golden brown. Remove from the oven and place the sheet on a cooling rack for a minute then gently lift with a spatula and place on a cooling rack. Allow them to completely cool off. Store in an airtight container. Serve them with warm milk.